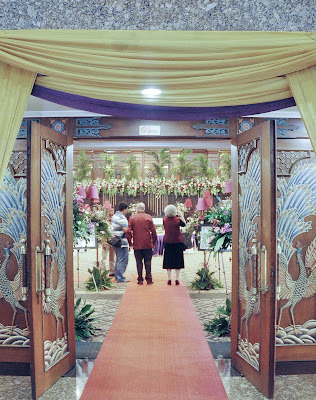 The title above is the phrase Michael and I were taught to say by Purwanto (our driver) on the way to Gedung Granadi, on Jalan Rasuna Said, where Saturday's spectacular Javanese wedding was held. It means "may you be happy," a wish that, to judge by the gentle interaction between the bride and groom, seems quite likely to come true. 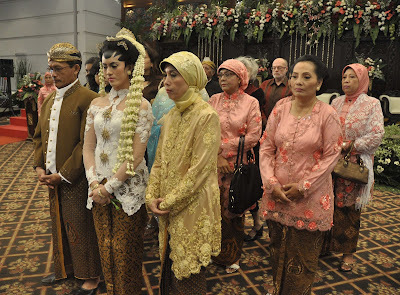 The ceremony is so solemn, so rich in tradition, that a young couple must think long and hard about the vows they are making to each other and to their families. Instead of putting Michael's video of the occasion at the end of this post, as I usually do, I'm going to lead with it as an excellent overview of the high points. Be sure to have your sound turned up for the full effect. Dramatis personae will be identified via photos later. 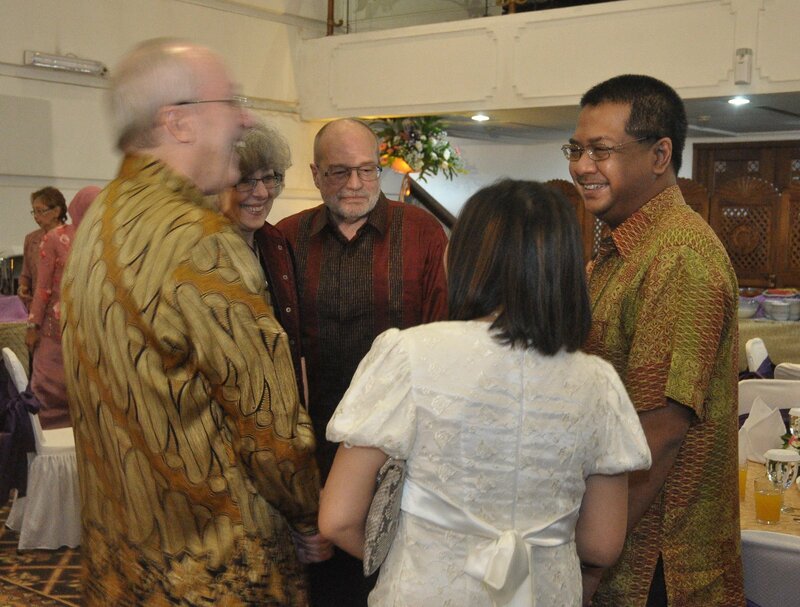 We arrived at 7:15 a.m. as privileged witnesses of the private ceremony that preceded the grand gathering at 11. Unfortunately, my camera battery ran out before I realized that Wulan (who works in Michael's office) would be making another entry in a different stunning outfit for the second half of the ceremony. 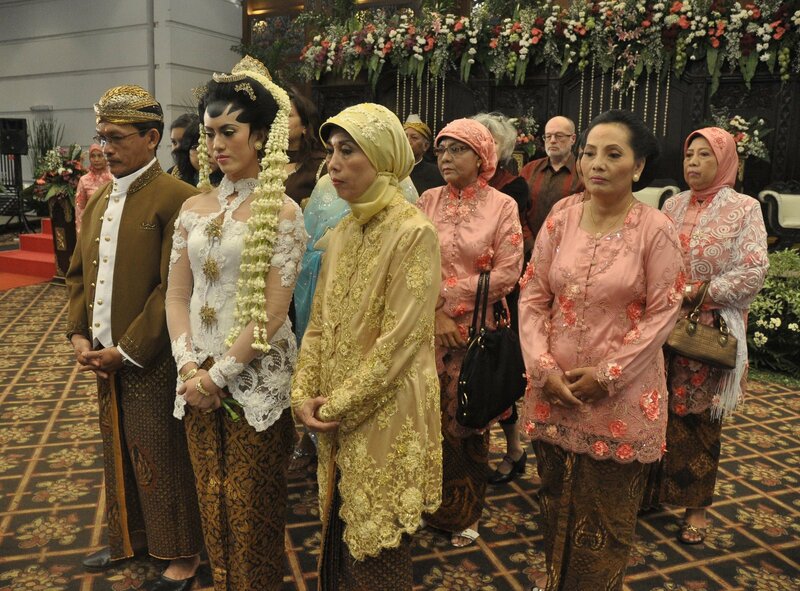 Everyone in the bridal party had changed, but of course it's the bride one's eyes are immediately focused on. Luckily Michael can grab a few stills from his video to cover the reception. I hadn't stopped to think that flash photography would drain the battery so quickly and was snapping away in my usual over-enthusiastic fashion. 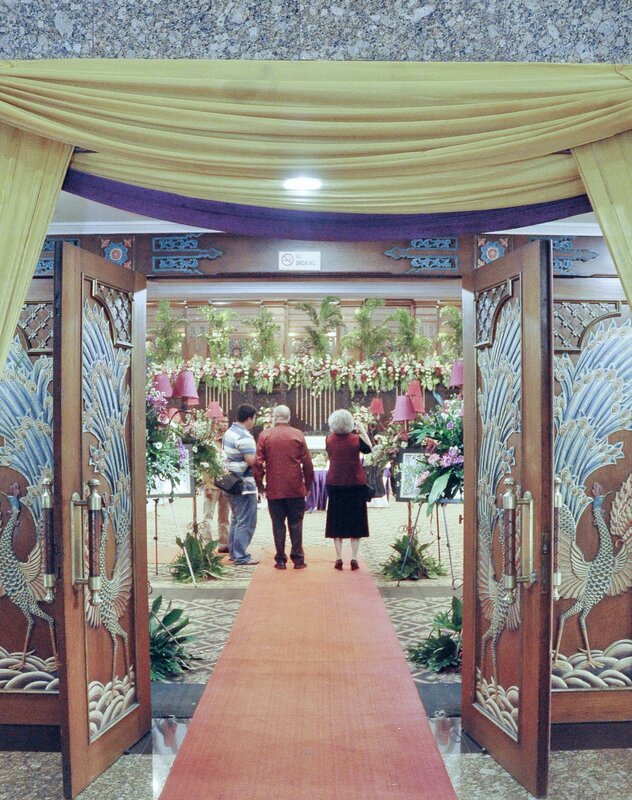 When we entered the lobby of Gedung Granadi, three of these decorated bikes were the first intimations of the floral extravaganza to come. Close-up of flowers above dais. The trailing chains are jasmine blossom. Serving bowl and ladles, waiting to be filled immediately before the luncheon feast. Wulan's father, Bambang, in center; her brother on right. The latter informed me when I complimented him later on his appearance that the outfit was rented, purple being his sister's choice, not his. All males in tradtional Javanese dress had a kris stuck in their waistband. Winarti's wonderful hijab. Here it's called a jilbab, although in most of the Islamic world the term refers to a garment, not a headscarf. Djoko and Naomi, parents of the groom. A most hospitable member of the wedding party, who took us under her wing, making sure we were in the right place at the right time, including sitting at one of the reserved tables for lunch. The groom's decorated kris. Aris had to hand this over to a relative when it was time for the formal signing of marriage documents. 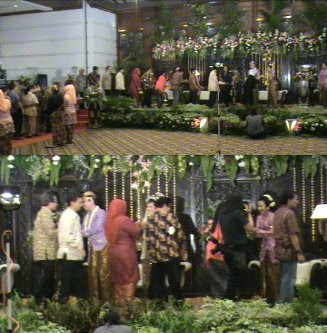 Males from both families gathered at a central table for what appeared to be both civil and Islamic registration. The father of the bride was always impressively erect, sitting and standing. 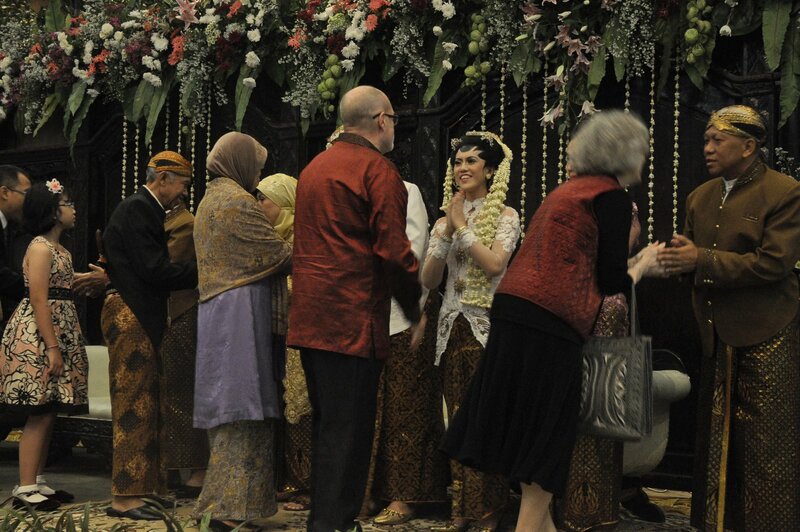 Aris looking very happy as he waited for Wulan to appear. Other guests waiting for the big moment. Wiji Dadi ritual, where the groom crushes an egg with his right foot, which the bride then washes with water perfumed by flower petals. 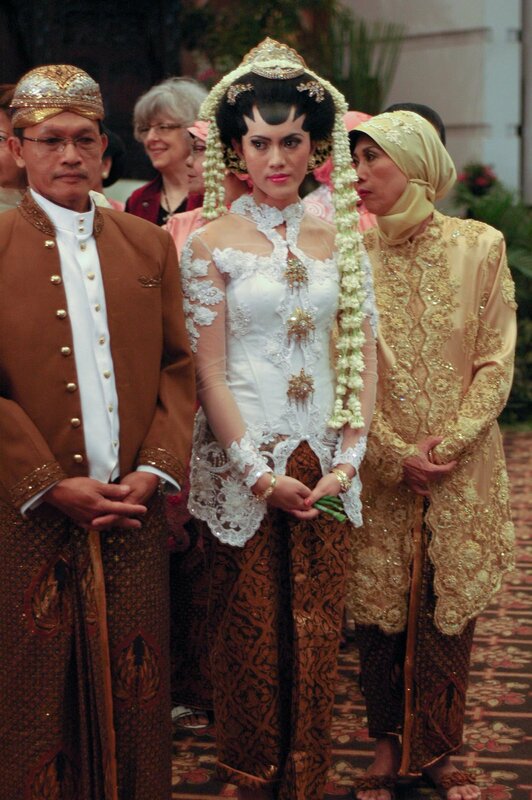 [Many thanks to Novie for providing me with a printout on Javanese wedding ceremonies.] This symbolizes the groom's being ready to take his place as head of a family and the bride's willingness to serve her husband. You can just spot the egg in the first photo if you look closely. With Bambang leading the way, Winarti covers the couple's shoulders with the sindhur: the father guides, the mother supports. The woman in purple is, I believe, one of the Pemaes team, in charge of makeup, costume, and ritual. The couple feed each other, symbolizing a life of sharing. 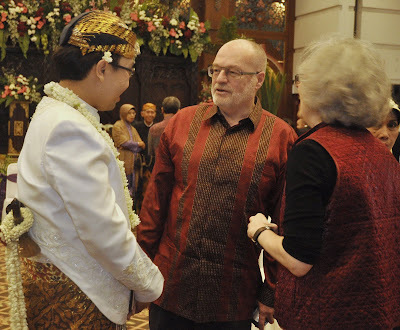 This is the part of the ceremony Michael would like to see incorporated into Kate and Robert's wedding: Sungkeman, asking the blessing of the parents/in-laws. End of formal ceremony. Time for snaps with family and friends. Carrying the sanggan (? 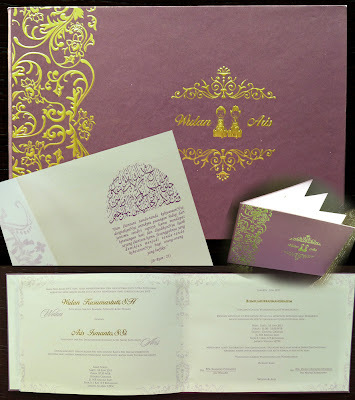 ), a traditional gift from the groom's family to the mother of the bride. I'm going to have Michael check with Anggoro whether this actually is a sanggan. 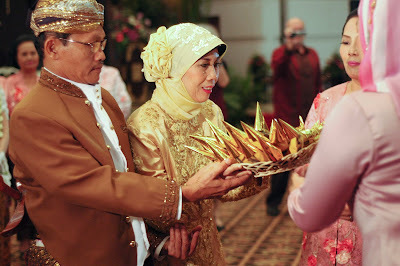 One of the young lads who cleans our apartment, a Sumatran, thinks the gold cones look like the curved roofs of a Minangkabau rumah gadang and are part of a different wedding tradition. Now the definitive Javanese answer: Anggoro wasn't sure of the exact name used for this gift, but it is presented by the groom's family to the hosts and contains: banana, symbol of independence; sirih leaves (used as a tooth cleaner), symbol of starting anew; fried black chicken, symbol of prosperity. Random photos between private ceremony and reception. Breakfast snack upstairs to tide us over until the official banquet. 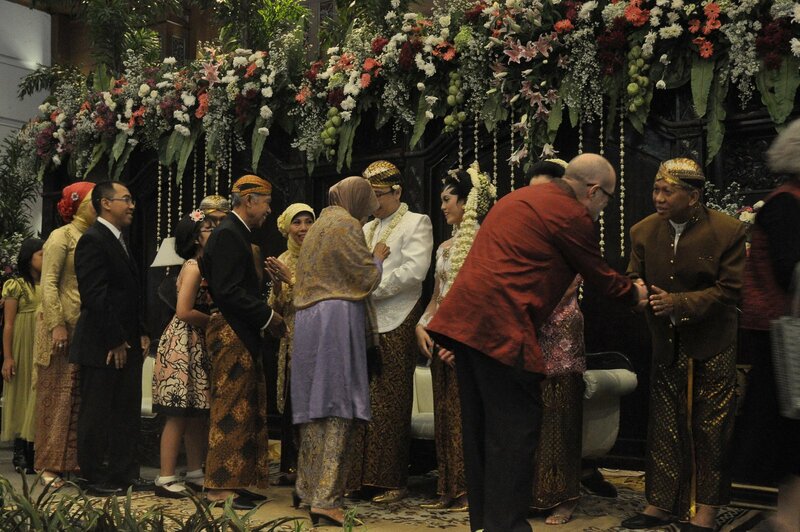 Bambang with Wulan's older sister, his granddaughter, and son-in-law. Am I a cuckoo in the nest or what? The official greeters now stationed in the lobby to welcome guests. Michael and Djoko's nephew, who may be emailing me a list of his favorite Jakarta restaurants. A scene glimpsed frequently: elegant traditional garb, accessorized with a cell phone. After much sociable anticipation, it was time for the chandelier to cast its glow over the second arrival of the bride and groom. They were led back to the dais by the cucuk lampah (thanks to Anggoro for identifying this figure for Michael). This is where my camera gave up the ghost. Photos here on in are stills from Michael's video. Traditional dance, Gatot Kaca wooing Dewi Pregiwa. The second reception line of the day. 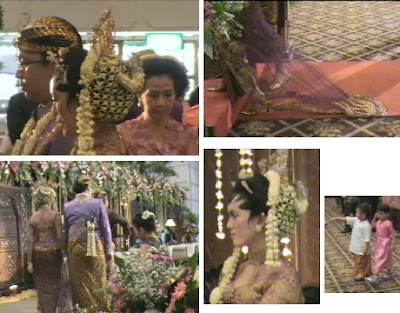 Below is a link to Aris and Wulan's webpage, with photos of events leading up to the wedding day. See particularly the album dated February 03, 2011. The wedding invitation, a multi-page hardback booklet, in itself a work of art. 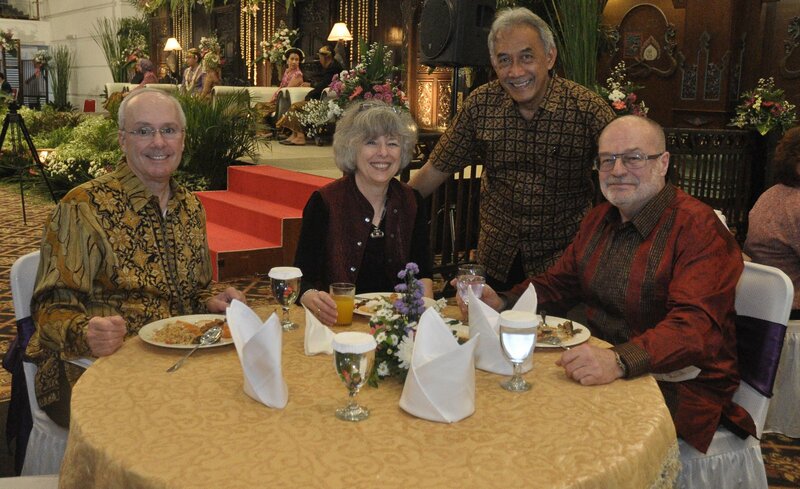 Below are some photos Wulan passed on to Michael, carefully edited from a larger selection of snaps featuring the Wellands. Michael decided to spare me some of the images that might have encouraged (a) starvation and/or (b) wearing a bag over my head.